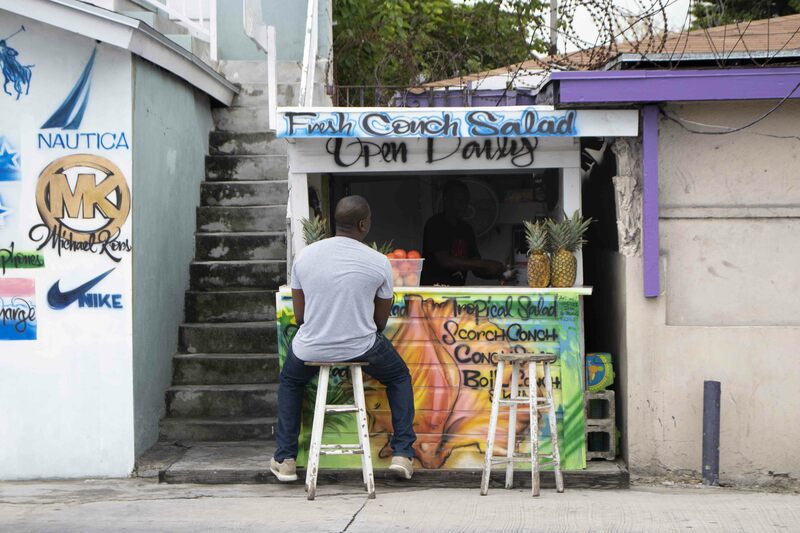 This conch salad stand is in the middle of Wulff Road, a busy street in Nassau with everything from mechanic shops to schools to churches. It’s pretty long and gets lots of traffic, so it makes sense that the owner would want to set up shop here. 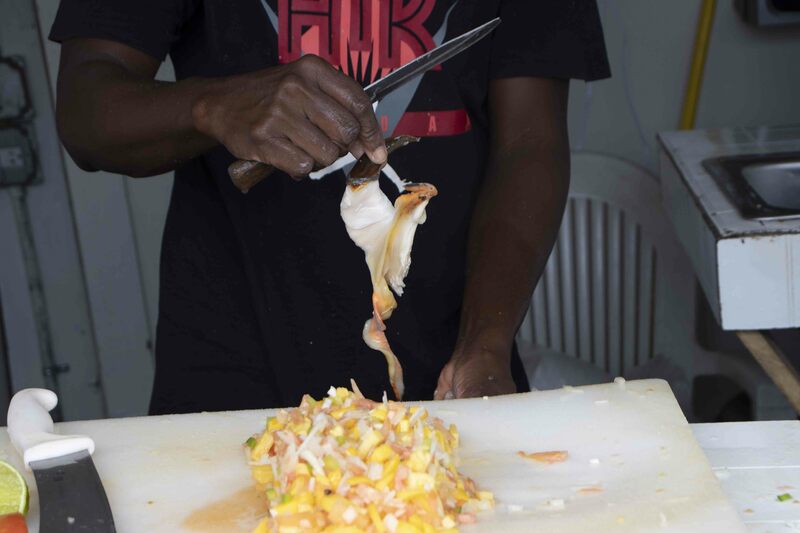 I used to wonder how good the conch salad could be though, being far – relatively – from the ocean. Turns out the answer is amazing! Yvenon regularly works 10 hour days, and is even open on Sunday, once he’s finished with church. When I stopped by there were 2 other people waiting on their orders. 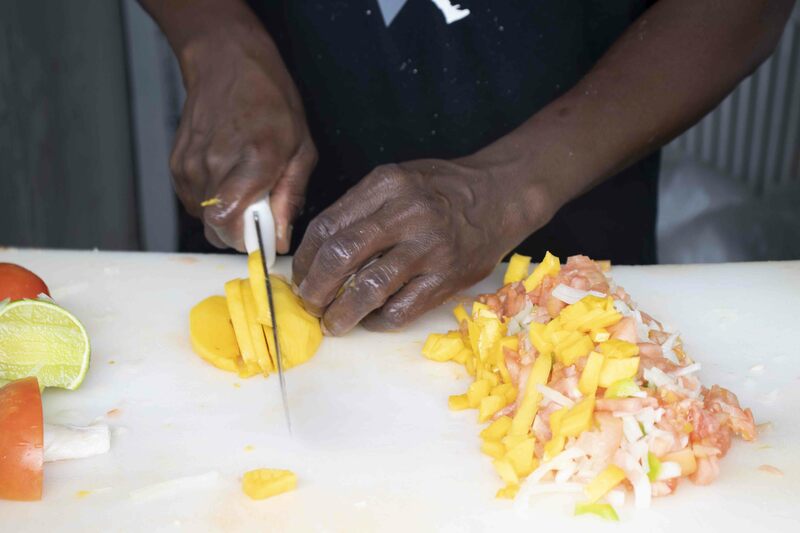 Here you can see him making a tropical conch salad, which has mangoes and pineapples (and sometimes other fruit) in addition to the classic onion, tomato and sweet pepper used in the original. 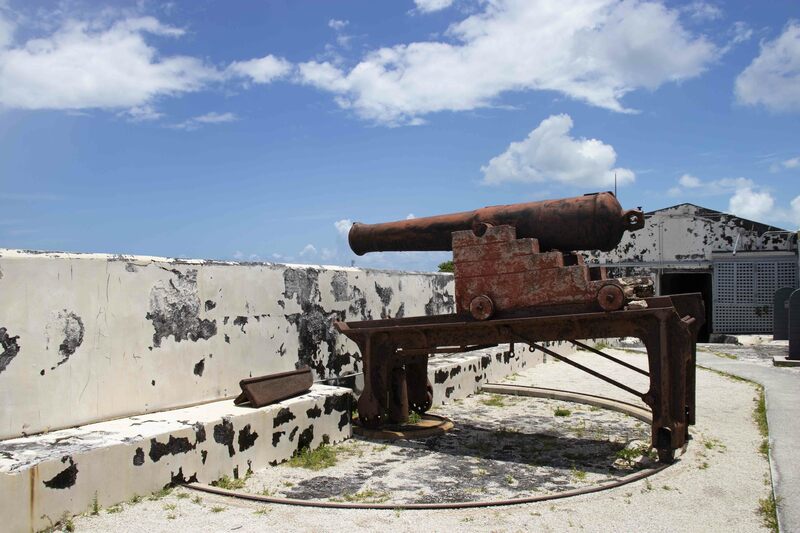 Fort Charlotte is one of a few forts on our island, and it’s got a really interesting history despite not seeing any action in its 100-odd years. I took a couple girls from my church there as part of an outing yesterday and we had a lot of fun! 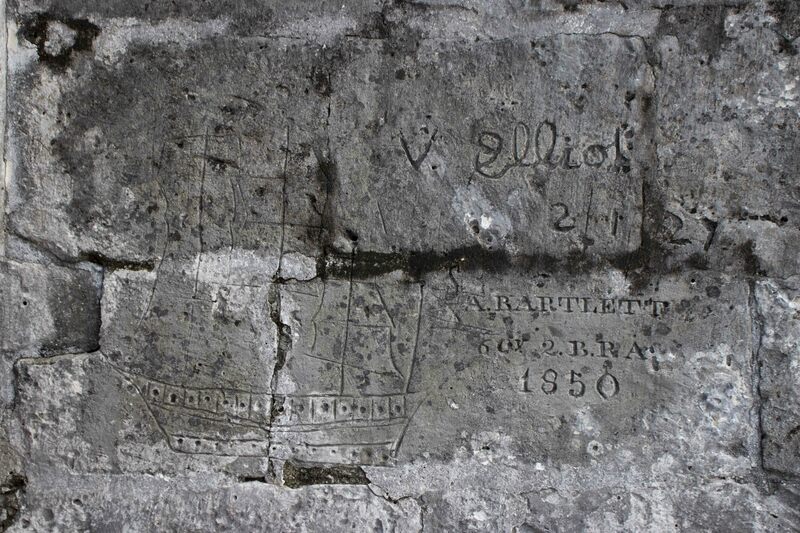 In the top picture you can see some 18th century graffiti – maybe a bored soldier was carving the ship he hoped to do battle in? I’m also curious about that official stamp for the mysterious A. Bartlett 1850. As legit as that canon looks, it’s not one of the originals. Those were made of bronze and quickly sent back to England once the fort was decommissioned. Couldn’t have that valuable metal just hanging around! Here, a picture from the top of Fort Stanley; it’s on the same acreage as Fort Charlotte and if you didn’t know better would think was part of the same building. Fort Stanley was where they kept all the weapons, and Fort D’Arcy, another minor part of the Fort Charlotte complex, was where they kept the ammunition. Wasn’t it a beautiful day? I made a picnic for myself and the girls: cheese spread sandwiches for them, a lentil loaf sandwich for me, and we all cooled off with watermelon. 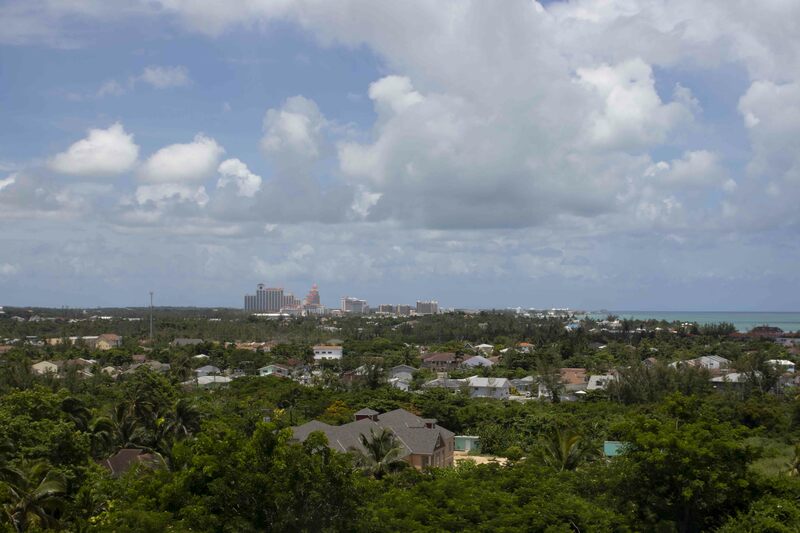 We sat on one of the grassy knolls beside the fort admiring the ocean and avoiding ants. 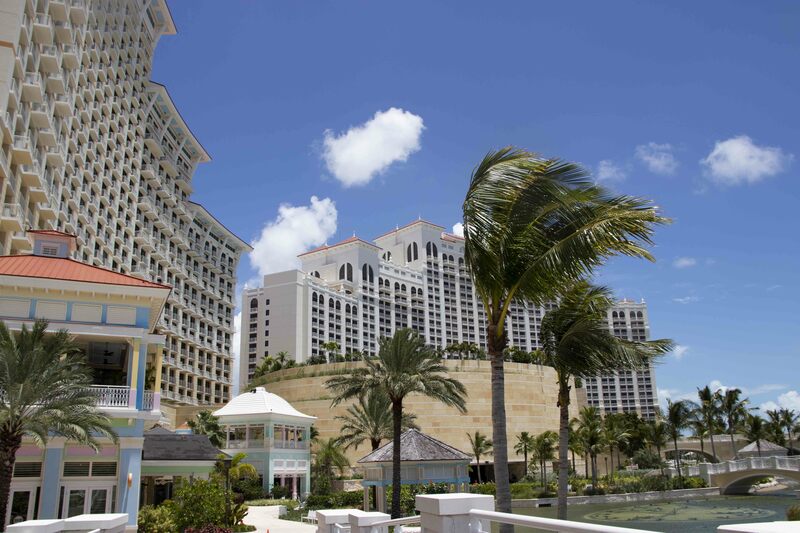 Then off to Baha Mar – which you can see at the horizon in the picture above. I took them to get a look at the property in general – which I visited for the first time only last week – but also to see The Current art gallery and the Fairwind exhibit. The Current is a really neat space. It feels very welcoming – there’s a studio in the back you can walk into! and a reading nook with art books on the walls! Both times I’ve been there the music has been so soothing I shazammed all the songs I could. 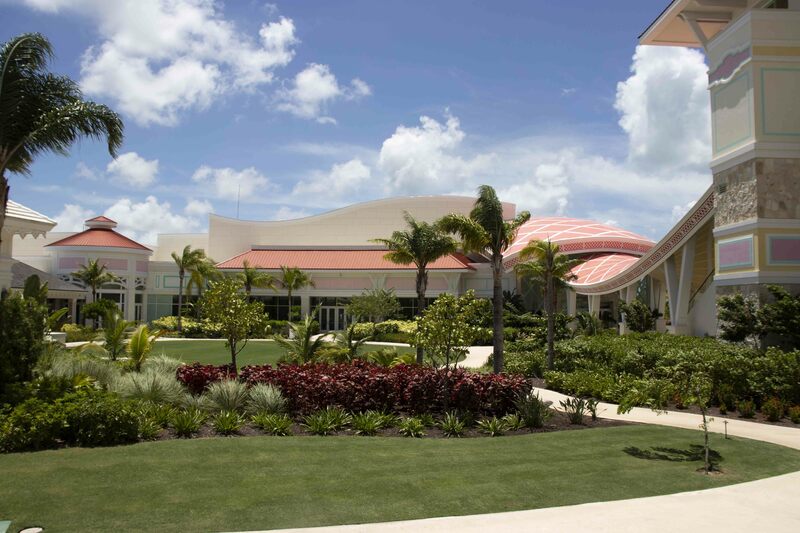 The gallery is what finally got me out to Baha Mar in the first place, although it’s been open a couple years now. I wanted to see the Fairwind exhibit, which it turned out is in the convention centre – that’s part of its pink wavy roof in the bottom picture. You should definitely go see Fairwind; it’s a 100 year perspective on Bahamian art, with all sorts of media, all sorts of scales and put together in a pretty intuitive format. There are lots of pieces (one reason I’m sure it’s not in the Current) and in addition to artists familiar and beloved by me I was happy to find some new people to check out.